Dr. Vandana Shiva changed my life. You could be next. I first heard of Dr. Vandana Shiva about nine years ago. At the time, I was burnt out from overwork, apathetic about the state of the world and just drifting through life. I received a postcard inviting me to a weekend-long technology and globalization teach-in organized by the International Forum on Globalization. I was unfamiliar with the speakers, but something compelled me to cancel my weekend plans and get myself to Hunter College. This is where I first heard Dr. Shiva speak about the World Trade Organization, globalization and genetically modified organisms. I woke up. How could all this have happened? Where had I been? Over the next few months, I shifted from an apathetic day-tripper in search of my next entertainment to someone with tightly held beliefs on big issues, be it monoculture of the mind, bio-piracy, natural capitalism, television and the cloning of cultures, indigenous cultures, genetically-engineered food, weapons in space, corporate agriculture, the precautionary principle, Gandhi or local food. My personal paradigm shift pulled me deeper and deeper into environmental action and social justice work. Eventually—and despite significant apprehension—Dr. Shiva's modern day Gandhian message drove me to revisit India after a quarter century, in search of a culture I'd left behind. I did this not as a tourist, but as a student at Dr. Shiva’s newly formed school, Bija Vidyapeeth. I signed up for the school's very first class: "Sustainable Living: Learning From the South." During this three-week course, I learned about the importance of biodiversity, seed-saving, water conservation and rainwater harvesting, centuries-old medicinal uses of local plants and even the evils of bottled water. The course made me much more aware of my own consumption—especially items that generate trash and are highly processed. I realized how little one actually needs. I met entire families living contentedly and with dignity, possessing but a few pots, clothes and cots. I learned that what’s actually essential has been gradually pushed to the background in our culture: clean air, water and food. Needless to say, this was a big shift for a technologist who'd grown up in a household thinking West knows best. 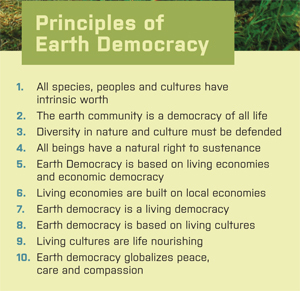 At the time, Dr. Shiva talked about “Living Democracy,” now dubbed “Earth Democracy.” I find this term difficult, but realized recently that democracy, as we use it, only includes people eligible to vote and, recently, corporations. Rights of the voiceless—the incarcerated, children, animals, plants, marine life, extinct species and the planet as a whole—have been omitted. Dr. Shiva has conceptualized Earth Democracy not just for people currently alive, but also those to come, and to honor the wishes of those long gone. The ideology emphasizes the rights that all life should share: right to biodiversity, right to food, water rights and the right to thrive across generations. Dr. Vandana Shiva is an inspiring leader in the international environmental movement. Come hear her speak at the Academy of Natural Sciences and be prepared for a radical shift in your worldview.